300A Equipment Group, Trailer Tow Package Class II, 19 inch Aluminum Wheels, Leather Trimmed Seats! This burgundy SUV has an automatic transmission and is powered by a 250HP 2.0L 4 Cylinder Engine. Our Edge's trim level is Titanium AWD. 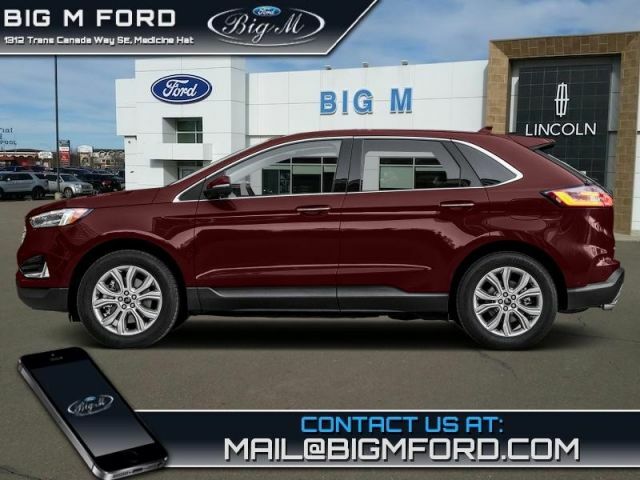 This top shelf compact SUV will get you the amazing Sync3 complete with wifi, a premium sound system, an 8 inch touchscreen, Apple CarPlay and Android Auto compatibility, and FordPass Connect. Keeping the luxury going is heated power seats with memory settings, memory setting side mirrors, wireless charging, a leather steering wheel with cruise control and audio controls, dual zone automatic climate control, and a hands free power liftgate. This SUV also comes with blind spot assistance, lane keep assist, automatic headlights, fog lights, remote start, and a rear view camera for added safety. This vehicle has been upgraded with the following features: 300a Equipment Group, Trailer Tow Package Class Ii, 19 Inch Aluminum Wheels, Leather Trimmed Seats. View the original window sticker for this vehicle with this url http://www.windowsticker.forddirect.com/windowsticker.pdf?vin=2FMPK4K9XKBB29047. Buy this vehicle now for the lowest bi-weekly payment of $289.56 with $0 down for 84 months @ 4.49% APR O.A.C. ( Plus applicable taxes - $599 documentation fee ). Incentives expire 2019-04-30. See dealer for details.